Over the last couple of years Dotz has established himself as an artist to look out for, from Battle Rap beginnings as UK Jump Off champion and appearances at Don’t Flop events and International battles the Bedford, UK emcee has followed that up with quality solo music as well as successful, well received releases as one half of Phili’N’Dotz and one half of Filthy Funk. On Friday (24th June) Dotz will drop his latest EP ‘Bring The Soul Back’, produced solely by Philadelphia based Elbe Kim. It’s a pleasure to welcome back our HHLAT brother Adam to the team after a brief hiatus away focusing on his own music with his first review of 2016 and here’s what he had to say about Dotz’ new EP……. The sun will always rise and fall, the tides will always come in and out and Dotz will always kill everything he does. Bold statements out the way I’ll just be honest, it’s mad to think Dotz has only been about for a few years when you look at how consistent he’s been. The freshest addition is the brand new EP ‘Bring The Soul Back’, produced entirely by aptly soulful Elbe Kim. Another 5 tracks that showcase the depth of talent of Dotz, growing again still this is by far the most open and personal release so far. The effort and care put into this is blatant, rather than just a collection of tracks it plays like an actual fluid project carrying a theme throughout. ‘Bring The Soul Back’ is packed full of reflective content, he speaks candidly about his problems in all aspects of his life and I found myself impressed with just how open he has been, clearly using his art for closure and self therapy. That is in no way to say it’s a downer or something like that, because it is exactly the opposite it does what it says it will, brings the soul back. He also talks on many concepts including standing up for what you believe in and dedicating a track to his true love. Every track is solid and well constructed, Elbe Kim is a producer who obviously works very, very hard at his craft. Groove heavy production drives this EP effortlessly through speakers, with several appearances from absolute legend DJ JabbaThaKut and his magic carrying it all along perfectly. Then right, yeah, THEN there is this posse cut. . . . *screwface* . . . featuring Dotz, Skrabl, Blizzard, Tony D, Blak Twang, Wordsmiff Flip, Peterz and DJ JabbaThaKut. . . . look at it, go on, its even better listening. 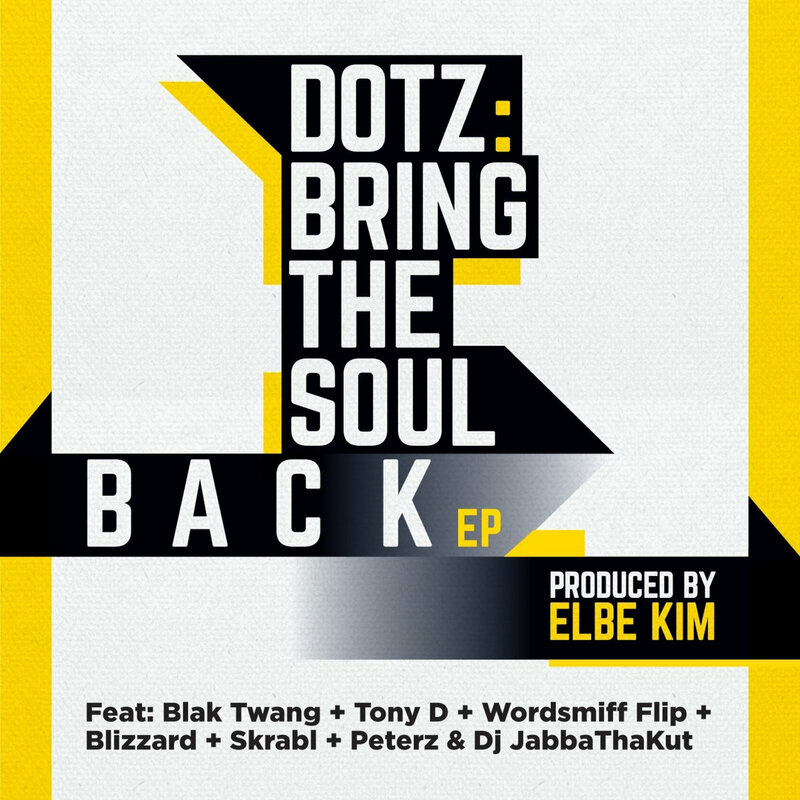 Pre-Order/Download Dotz’ ‘Bring The Soul Back’ EP for free or buy a limited edition CD, but make sure you check this release out, it is mint.